The girls have been learning how to take images and our surroundings and be inspired by them, and then how to properly translate that inspiration into a good fashion design. E and H need to pick two images from the slideshow below and make an outfit inspired by each (so, two outfits, one for each image). Are you having fun with the design? If not, don’t do it. Is it a thing? Can you say, “This fashion looks like a ________(fill in the blank with something you have seen before).” If so, then make your inspiration less obvious. Let your audience enjoy the process of thinking about how your design is inspired (not just showing them immediately). The last two sessions, the girls got out of the box – the fashion box. To be fashion outside of the box, it has to be something that you haven’t seen before and most likely something that you wouldn’t actually wear outside. Designers push themselves out of the box to gain inspiration and loose limitations long enough to take what they have gleaned back with them inside the box so they can make fresh new fashion that people will actually wear. The last two sessions have been a brief break from designing fashion to leveling up on the drawing skill side of things, before we move on to the final projects. The girls practiced drawing fabric, noting shadows and highlights along the folds, imagining how different weights and thicknesses might effect how it would look. Lastly they tried to wrap their noggin around drawing a noggin. Even though they use stencils for the mannequins, it's helpful to have an idea for the shape of our face and head to accurately draw hair and fix proportion mistakes. 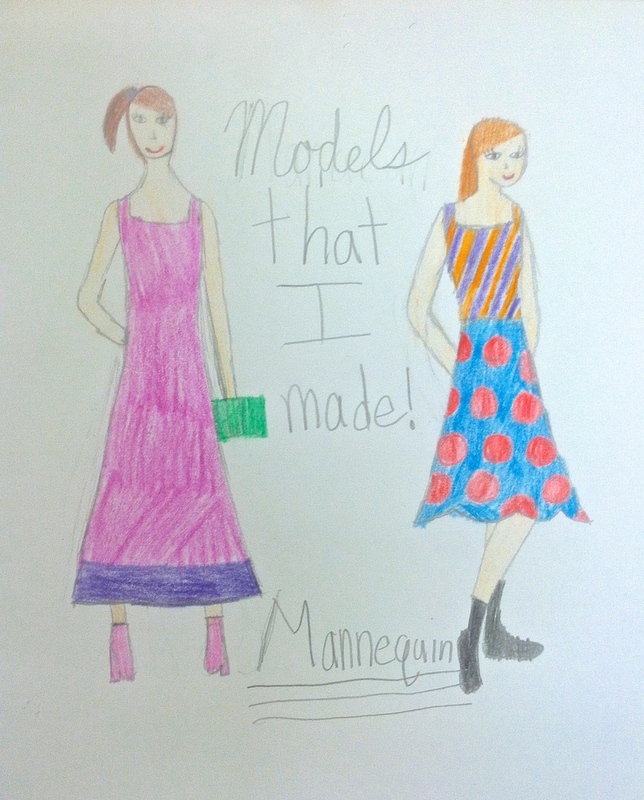 With each Fashion Design session, E and H remind me why I decided to teach private lessons. Never before in my history of teaching have two students worked so hard in my absence. They had two weeks without my guidance to finish half of their project (about 12 designs total), and I was totally impressed with their finished work. Before my trip, they were instructed to finish their then project: Create looks for each color relationship we studied. I wanted them to experience the possibilities and limitations of restricting their designs to certain color relationships. Our discussions of their experiences and how the restrictions made them think differently about how to approach a design proved to be invaluable. 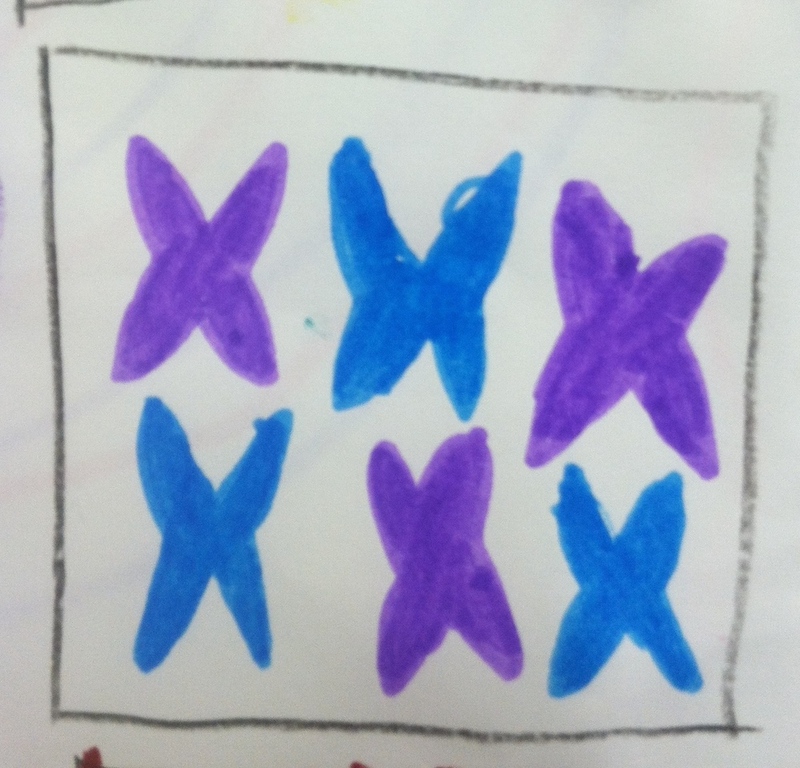 One thing they found was that the more colors they had to choose from the more the design revolved around the colors. Yet, like with monochromatic, they had to put a lot of thought into the design to make the look work, since they only had one color to choose from. There was also a lot of talk about light bulbs going off about what, how, and why some colors work together and what that means for the final design. E and H’s first big step in applying color theory started this session. They drew 14 mannequins, 2 per page. On each page they will draw two outfits and are limited to only using a particular color relationship. For example, on one page, they can only use complementary colors and the next, split complementary, etc. They also practiced colored pencil techniques to vary their types of clothing texture and patterns. To start the new semester, H and E are learning some color theory that we will use throughout the semester. It helps for them to develop a language that we can all use to discuss the color choices they make and to identify what color relationships they like and why they like them. They (safely) cut out stencils that show specific color relationships on the color wheel. Here is the list of all they learned today. You should quiz them :-) I think they would enjoy it. Though, it may be harder without their color wheels in front of them. The sunset offered a good opportunity to quiz them on the way out. They may never see sunsets the same way again. H and E have genuinely been impressing me with how well they have been integrating what I've taught into their drawings. This really shows when comparing their earlier drawings (see pictures below). The main goal today was to incorporate fashion and drawing concepts about hair style and shoes. "Beyond an outfit, hair style and shoes can tie a whole outfit together or throw the whole thing off. Think about the purpose of the outfit, its overall design, the temperature outside, the mood of the person wearing it. Use these as guides to decide what hair or shoes work with an outfit." Hair: "Hair has volume. It takes up space. It is not painted on your head." Shoes: "Shoes just take practice to draw well. No other way around it. Learn to visualize the shape of the foot and draw the shoe on that shape." On Wednesday, H and E took their fashion repertoires a bit further, looking at a selection of common fashion elements, such as various necklines, dresses, skirts, pants, and jackets. They had to pick which elements they thought would look good together into one outfit. We are laying the foundation for the ABCs of fashion, so they can, in time, make a more educated expression of what fashion inspires them. H and E practiced the process of making a Fabric Design (the colored squares) into a Fashion Design on a mannequin, which, in a nutshell, is exactly what a real Fashion Designer does. Then, they are in the process of going through that process backwards, making observations about how a finished set of cloths might have started with just fabric squares. From a pile of fashion examples, they picked one that was their favorite. They still need to color their last work, but I was genuinely impressed with how well they slowed down and concentrated on the textures and designs in the pictures they chose. They are doing great! Today, E and H tried out using stencils to draw the mannequin figure. 1) To imagine how light or heavy fabrics hang on the body. 2) To remember that our bodies are not flat, they have round shapes, and when something flat is placed on something with shape, it takes that shape. So no straight across neck lines or belts. They need to curve. So good so far :-) They are doing great and I’m looking forward to digging in deeper with the course. (click pics to enlarge). 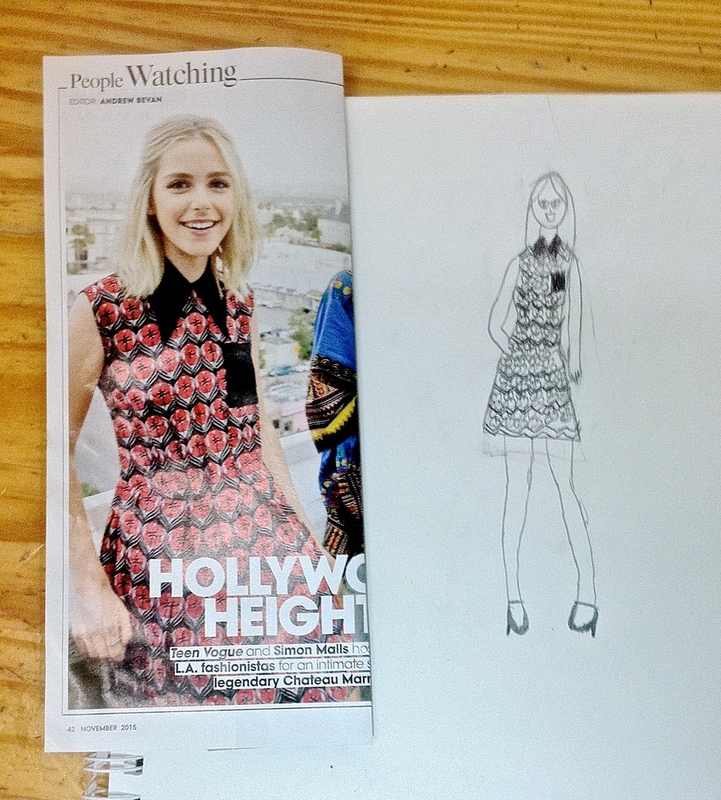 Wednesday, the girls used their recent designs in their new inspiration books to draw a few fashion designs, mostly so I could assess where they were in terms of drawing people and cloths in general. I didn’t get to take a snapshot, but they are doing pretty good for not having any direct instruction from me yet. I told them that this isn’t a “drawing people” class so we will focus more on the fashion design, and I imagine we will make some stencils for the models. Wednesday, the girls began making their inspiration books, which will be a collection of their own artwork and other images that they will draw visual inspiration from when they start working on their fashion designs. On Wednesday’s Fashion Design session, Hana and Eva began learning about inspiration. They started Inspiration Books, which will be filled with all manner of images, paintings, drawings, etc. from which to draw inspiration and observations. 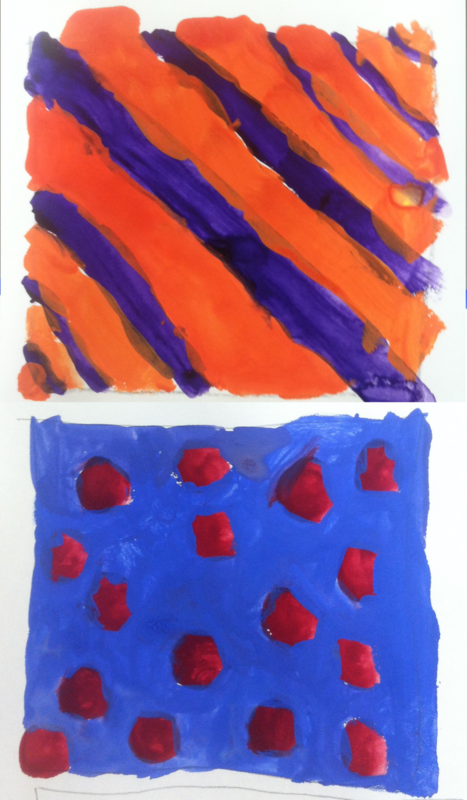 They started by making abstract designs and patterns using colors they enjoy most. I asked them what they thought it might meant. I added that in the same way we can paint, draw, sculpt, photograph, etc. we can be creative and expressive with our fashion. We shouldn’t be excessive about it but we can enjoy it just the same. Plus, dressing nice is a way of showing respect to the people around us. The girls answered about materials and tangible elements: Fresh food and nice plates, high-tech cameras and actors, instruments and musicians. And the girls answered about artists: Chefs, directors, and conductors. But the key element that it takes to make great food, movies, and masterpieces is…..*drum roll*…..Inspiration! What inspires H and E as fashion designers is the springboard for the course. Today we made sure we were on the same page, going over the basic idea “What is fashion?” and fashion terms. Aside from the list of elements we made (tops, bottoms, hats, shoes, accessories, hair, and makeup) fashion is the art of expressing oneself through clothing. As the class continues, the girls will have ample opportunities to fine tune their practical art making skills along with their appreciation for fashion. Conceptually, my goal is to focus on fashion as an art form, while avoiding its not so fashionable aspects, such as materialism, poor body image, etc.